Boat ownership is an evolutionary process for most of us. Happenstance pushes us along in our initial boating experiences, but as the years go by, we develop a firm grasp of what is important in design, construction, and intended use of all of our subsequent boats. We may try different styles and types of boats along the way, but eventually it is clear to us what we want in the next boat. For Jim Mitchell, this evolutionary process began early in life. At 11 years of age, he built his first small wooden sailboat. As he grew up and his professional life progressed (he schooled in both engineering and economics), Jim always also seemed able to spend time around water and boats. In the mid-60s, while working in Korea as an economic strategist, Jim decided to take advantage of his overseas situation, so he started planning his first big boat building project-using the considerable skills available in Korea. A design by his friend, John Atkins, caught his eye, and he used the schooner Island Princess as the basis for his new boat. Jim found the Korean workers to be skilled craftsmen, but there were unusual difficulties as far as communication, measurement systems, and the workers&apos; unfamiliarity with traditional boat building plans. But Jim persevered, and nine months later Hae Yong was launched. A traditional wooden schooner with many blocks and miles of running rigging instead of winches, this 37-foot schooner, whose name means "Sea Dragon" in Korean, turned out to be a wonderful boat. When his job in Korea was completed, Jim had her shipped to Panama, where he sailed her home to New England in 1968. Jim married Lolly in 1973, and the Mitchells lived happily ever after-until they had one of those incredible events that forever changes people&apos;s lives. While Jim was working in foreign service in Iran, a terrorist attack on a Pan Am flight brought new meaning and value of life to the couple. Although Jim was not hurt, the disturbing experience made them realize they wanted to do something different-and together. Ultimately they bought a 45-acre vineyard in Rhode Island, and built a successful business together. Sakonnet Vineyards became a passion for the Mitchells, but left them little time for boating- so they sold Hae Yong. Today Hae Yong is still sailing in Buzzards Bay. The years went by, the Mitchells&apos; business settled down, and they decided it was time to get another boat. Over the next several years they owned several different sailboats, but found them wet, uncomfortable, and lacking real cruising capability. Eventually the Mitchells came full circle, going back to the traditional wooden schooner design, with low technology and no winches. (This simple KISS theme rolls through Jim&apos;s boating life and is a key component to his eventual development of Kintore.) The Mitchells contracted Joel White at Brooklin Boat Yard to build Vintage, a scow schooner from a Peter Culler design. This downeast schooner was 48 feet LOD, 67 feet LOA, and drew 3 feet with the centerboard up. Built with 3.5-inch planking, Vintage is a model of 1800 boat building technology. time in the Chesapeake Bay area, eventually returning to Camden, Maine, late in 1989. By this time, Jim and Lolly realized the realities of running a schooner no longer fit their situation. They were getting older, and it was just too much work. Raising the mainsail, for example, involved lifting some 500 pounds of sail, booms, and rigging. In 1993, they sold Vintage-but they loved every minute of their time aboard her. Around this time Jim and Lolly noticed a design published in Wooden Boat, a collaborative effort between Bill Garden and Maynard Bray. The traditional Dynamo motorsailer intrigued the Mitchells-it was a direct descendant of the seaworthy West Coast halibut fishing boats. Forever the engineer and designer, Jim redrew a set of lines from the Wooden Boat article, making the motorsailer a little smaller to fit their needs, but he kept the overall profile of Dynamo. The design was attractive for several reasons. While not an overly large boat, it seemed a tough and able boat that could go anywhere. A no-nonsense vessel whose big sisters have been safely fishing in Alaska for years. She had an easy run and fine entry. A good seaboat with an easy motion and a flared bow to keep her dry. At hull speed the projected fuel consumption would be quite modest and therefore economical. The living spaces were fine for two people out cruising, and the accommodation plan fit in a 37- foot boat. They didn&apos;t need guest accommodations as they already knew how much better friend/family visits are when the guests stay ashore and visit them on the boat. And of course-the Garden/Bray design had a decent engine room. The Mitchells wanted the capability to go long distance under power, and they knew that most sailors do just that all the time anyway. So they wanted a trawler this time around. Walking forward past the main cabin is a step up (at the sliding door into the cabin), past the rigging, booms, and gear for the paravanes. On the starboard side of the boat, there are also ratlines (rope steps attached to the rigging) that go up to the spreaders on the mast-a traditional and convenient way to replace light bulbs or tend to equipment aloft. The mast is set in a tabernacle, and can be lowered for canal passages and other cruising encounters. Jim and Lolly wanted to be able to take Kintore through inland waterways (even the French canals, which are the most restrictive) so they made sure the height of the boat could fit those requirements. The 4&apos;6" draft also reflects that consideration. Working together, Jim and Lolly can lower the mast and rigging in 15/20 minutes, and there are chocks atop the cabin to stow the stabilizer booms which must be removed if the mast is lowered. The foredeck&apos;s upper bulwark, known as the buffalo rail, is massive-9" by 4" at the stem and slimming to 3" wide farther aft. The stem itself is made from 10" by 6" timber. This is just what you would find on a heavy, traditional fishboat that is worked hard for 100 years between refits. The primary anchor aboard Kintore is a 60-lb. ABI plow, with 35 feet of 3/8" chain on 300 feet of 5/8" nylon line. They also carry a 75-lb. Yachtsman anchor as a super kedge, and a 22-lb. Danforth. Both secondary anchors are kept on 35 feet of chain with 300 feet of nylon anchor line. Jim spliced the chain/line himself and finds it much superior to a shackled anchor rode. The windlass aboard Kintore is very interesting and unusual-unless you happen to be a working lobsterman. Jim designed and built the windlass himself, patterned after a commercial workboat, and it is the epitome of rugged simplicity. It has the ability to pull 3,000 lb. Running a hydraulic pump off the main engine, hydraulic lines power a White RS16 hydraulic motor that is attached via R60 roller chain to a 1:1 ratio sprocket on a 1.5-inch stainless shaft mounted firmly in two pillow blocks. The two-way control valve provides the control to lift the anchor rode, as well as to pull the dinghy aboard. While some of the components were somewhat rusty after the constant use and exposure during their 8- month cruise, the equipment still functions perfectly. Jim reports they rarely take any water over the bow-it is 74 inches from the waterline to the bow. Even though Kintore is a very dry boat, all foredeck hatches are leakproof because they are built with double frames and drain channels. It is virtually impossible for water to get below when any of the hatches are dogged down. Radar, GPS antenna, horn, and searchlight are mounted on top of the cabin roof, and the vessel&apos;s documentation number is printed in large black letters across the cabintop-just like you might find on a workboat. There are large bookshelves along the top of both sides of the cabin above these settee berths. All of the large salon windows open, with two aft windows opening a full 90°. Ventilation aboard a wood boat is important, as well as being a necessary requirement for a serious cruising boat in the warmer climates. Forward of the port settee is a helm seat that contains a four-shelf navigation locker to stow books, guides, and other material. When chartwork is required, they use the salon table. The helm station in Kintore is simple but complete. The list of equipment includes a Magellan 5000 GPS with external antenna; Ritchie liquid compass; Autohelm ST7000 autopilot; Hynautic hydraulic steering; Furuno 1621 LCD radar; Standard Horizon VHF, depth, and speed instruments; an electric wiper on the forward pilothouse window; and switches for searchlight and electric horn. Stepping down removable steps into the forward living spaces, a U-shaped countertop is found on the port side of the boat. There is 6&apos;2" headroom throughout this forward area. The counter area measures 66 inches wide by 41 inches deep. In the center of the counter space are two stainless sinks. On one side of the U-shape is a cutting board recessed into the top of the toploading refrigerator/freezer, with the boat&apos;s electrical panel located on the bulkhead just above the counter surface. The forward end of the U-shape contains several drawers for storage of galley utensils and provisions. Lifting a small panel in the galley floor reveals the single raw water seacock, which feeds the head, salt water washdown, galley faucet, and refrigeration cooling. On the starboard side of the galley area is a Force 10 three-burner propane stove with a pantry area to the right of the stove. An opening hatch directly above the stove provides welcome relief when cooking in the tropics. There are also four opening ports in the galley area. 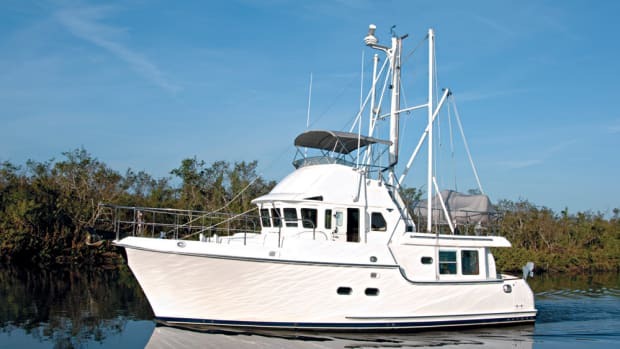 The Mitchells installed a Danish Reflex diesel heater for cruising the coast of Maine. The 15,000 BTU unit uses no electricity, and Jim reports it provides reliable warmth whenever they need it. Fed by a ten-gallon gravity tank, the heater warms the interior of the boat quite well, helped by a small 12-volt Hella fan that distributes the warmed air. The insulating qualities of a wood boat are excellent to begin with, so Kintore&apos;s interior is kept warm, dry, and eminently comfortable-even while cruising along the coast of Maine. Just forward of the galley is the centerline access to the shower and head compartment. A teak shower grate is in the center of this compartment, with its own sump drained by an electric pump. is worth it, however, because there is instant hot water for showers-especially important on a boat with a limited water supply. When they want to take a shower, no one has to stand around and watch as gallons of water are wasted until the warmer water arrives from somewhere deep in the engine room. Great idea. The forward stateroom has two 6&apos;6" by 30" berths arranged similar to a sailboat, in a V-berth style. A large set of louvered doors open into a sail and chain locker. The 120-gallon plastic water tank is located under the berths, and Jim uses a 36-inch notched stick to measure the status of the water supply. Speaking of water, Kintore uses the relatively large clean surface area of the cabin top to collect water while out cruising. A permanently installed drain system funnels into two hollow stanchion supports, which connect with hoses directly fed into the water tank. In a heavy squall, after letting the rain come down for a few minutes to wash off salt or dirt from the cabin top, they simply attach a hose into the water system and-presto-they fill their tank with clean rainwater. Since they have found water to cost up to 70¢ per gallon in some areas, it is a welcome relief to be able to collect over 100 gallons in a three-hour downpour! There are full-length book shelves on both sides of the hull, and there are two opening ports and a large hatch overhead. Storage space is plenty for two people. Lifting off the removable steps in the galley reveals a door into the engine room of Kintore. While there are two lift-up hatches in the main salon floor, normal access is through the galley, and the door opening measures 38 inches high by 21 inches wide. the prop at 500 rpm, and Jim has pulled some big boats back into deep water with his tug-like yacht. The Cummins diesel is keel-cooled with a Walter cooler, and Jim installed a dry exhaust system using a Cowl Silencer exhaust (a quiet exhaust system made in British Columbia). Jim added 2 inches of insulation on the engine room bulkheads and under the salon floor, so noise is kept to a minimum. With a fuel capacity of 540 gallons in two steel tanks, Kintore has a range of 2,500 nm at seven knots. Over the past 1,000 hours of operation, they calculated an average fuel burn of 1.34 gallons per hour-very economical! Two banks of golf cart batteries provide house electricity, and a Heart inverter/charger allows them to run the all important coffee grinder. The engine room is open and quite accessible, given the 11- foot beam of Kintore. Jim has no trouble checking oil levels, batteries, or doing routine maintenance. Kintore is a motorsailer, and doesn&apos;t sail without the engine running, despite the size of the mast, rigging and sails. The rig has 220 square feet of sail area in a jib and mainsail-which is quite useful as a steadying sail combination. The sailplan can even be considered a viable form of "Get Home" power-as long as you don&apos;t need to go to windward. In terms of stabilization, the Mitchells have had tremendous success with their paravane system. With any round bottom hull, you can expect the boat to roll in certain sea conditions-especially beam seas. While not particularly dangerous, this motion can be uncomfortable and tiring. The stabilizing gear aboard Kintore makes a world of difference in these conditions. At anchor or under way, the vanes (also known as flopperstoppers) can reduce rolling to almost nothing. Given the size of the boat and gear, the Mitchells have not found the system to be difficult to deploy, use, or retrieve. vanes (No. 2 vanes, available commercially from Kolstrand Supply in Seattle) pull down with force as the boat moves forward at normal cruising speed. Given the distance away from the boat, and the 500-lb. downward pull of the vanes, Kintore stops rolling immediately-and settles into a very gentle motion that would be expected on a MUCH larger boat. The Mitchells use the paravanes at anchor as well, to keep the occasional boat wake from disturbing life onboard. Jim runs a tag line to the attachment swivel on each paravane to aid in recovery. When he is ready to stow the system and retrieve the vanes, he just slows the boat, and pulls in each tag line one at a time. The vanes aren&apos;t particularly heavy or unwieldy, but again, the system is designed for a 37-foot boat. According to Jim, the only real difficulty is cruising blindly in lobster pot country. But that is a small price to pay for such an effective roll-reducing system. Paravane systems are very simple and uncomplicated for this size application, and are seen on fishing boats throughout the world. Jim and Lolly won&apos;t leave home without them. It took some time to get the ballast distribution correct aboard Kintore. The expected roll period (as per the original Garden design) was to be 3.75 seconds. When Kintore was launched, they measured a roll period of 4.25 seconds. After many attempts to correct the problem, it was ultimately resolved by removing much of the interior ballast, and bolting two 8" by 1.5" by 10&apos; lead sheets on both sides of the keel (using 16 bolts). This lowered the center of gravity, and brought the roll period down to its designed parameters. Jim and Lolly enjoy the simple cruising life, but have certain minimum requirement for existence. They love fresh coffee, so they insist on grinding coffee beans while aboard. They also enjoy a bottle of wine with dinner, so they have four cases aboard at any given time (three red, one case of white). They both love to cook, and enjoy concocting gourmet meals from local ingredients that supplement what provisions are aboard. They carry many cookbooks. Speaking of books, they are also avid readers, and the boat is stocked with all sorts of best sellers, classics, and must-read-next volumes. They prefer playing cards to watching television, and a routine of gin rummy in the morning is usually followed by bridge in the evening. When they arrive at an intended destination on their travels, Kintore usually stays at a marina rather than a mooring. Jim and Lolly enjoy exploring ashore and find that it is more convenient to get off the boat-so they do so more often. This gives them a chance to mingle with the local community and experience the flavor of a different culture. As Lolly points it, "You don&apos;t get to meet many experiences if you are anchored out!" like their kitchen table at home in Camden. The Mitchells don&apos;t follow a schedule, and recommend that anything resembling a schedule should be avoided. They offer one other interesting piece of advice-each person in the crew should be involved in a major project while cruising. Some worthy endeavor that will give purpose to an otherwise unrestricted lifestyle. Jim is currently researching and writing a book about his family history-six generations have been in America since 1735. Lolly is doing a serious needlepoint rug. They used a weather forecasting service (Locus Weather, 207-236-3935) during the eight month trip south, and recommend it highly. They found it good insurance to get professional interpretations and advice to support their own decisions regarding weather. While any outside service does not relieve the crew from accountability in all matters of running your boat, such professionals can help ensure good weather windows for passages between destinations. The costs are usually very reasonable, and once you are registered as a customer, all services can be used on an asneeded basis. Jim and Lolly enjoy Kintore as one segment of an active lifestyle that also involves the community and other important activities. Free from having to deal with a large boat and its complexity, they think Kintore is the perfect boat for them. If he had to do it again, Jim would have drawn Kintore ten inches longer, to take care of one or two minor inconveniences. But overall the project was a tremendous success. They would like to go on another cruise soon, but find summers in Camden too delightful to consider leaving again so soon. Ultimately, they want to take Kintore through the Erie Canal system in New York State, and circumnavigate New England. They also consider a trip back to Florida and the Gulf Coast. Kintore is a very appealing and unusual yacht- and Jim and Lolly are as unique as many of those actively living life on their terms. Building Kintore was a genuinely satisfying experience for both of them, and they will enjoy her for years to come. And Jim continues to believe in keeping things simple. The evolution of Jim Mitchell&apos;s boats is almost complete. Kintore may or may not be his last boat, but the concept is in place, the philosophy intact. And given the events that so affected their lives, they will continue to do whatever it is on their terms...and together.